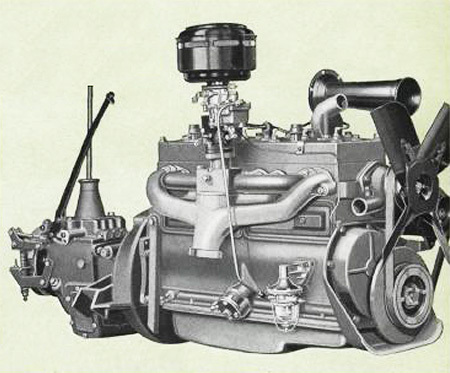 The manifold side of the new Green Diamond engine, showing the efficient, oil-bath-type air cleaner mounted directly over the downdraft-type carburetor; scientifically designed manifolds; crankcase breathers; and improved fuel pump. 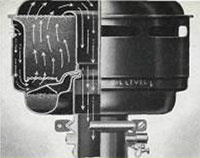 The inverted-type fuel pump is a safeguard against vapor lock and provides a constant supply of fuel under all operating conditions. In the glass-bowl settling chamber a fine mesh screen assures clean fuel. 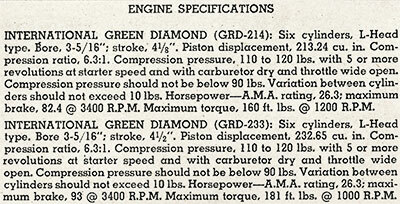 More power, greater fuel economy, and quieter operation are the features of the new Green Diamond engines in the five new International truck models, all between 1/2 ton and 1-1/2 ton capacities, which went into production at the International harvester works at Springfield, ohio, recently. 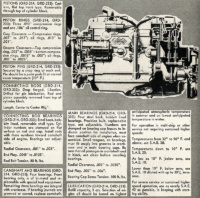 The greater power and fuel economy are the result of new manifolding, new cam contours, and new combustion chambers that are higher and more rounded in shape than those used in previous International engines of the same size. 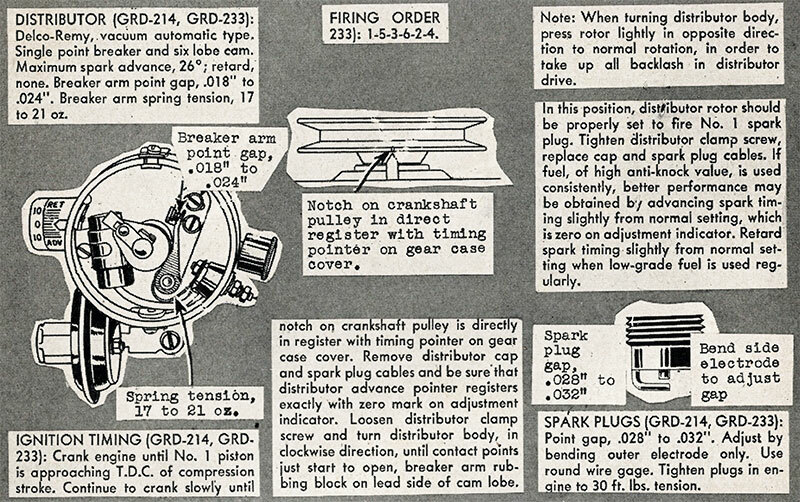 In addition, the spark plug is located near the center of the chamber. The new construction greatly improves the thermal efficiency, giving more miles per gallon of fuel. 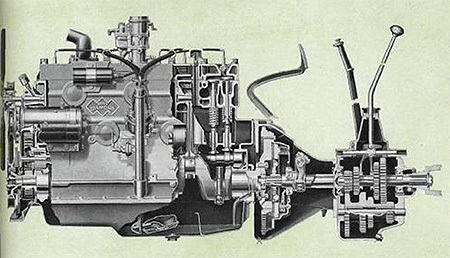 In this sectional view of the powerful new Model K-5 Green Diamond engine, clutch and transmission many important features are shown to advantage. 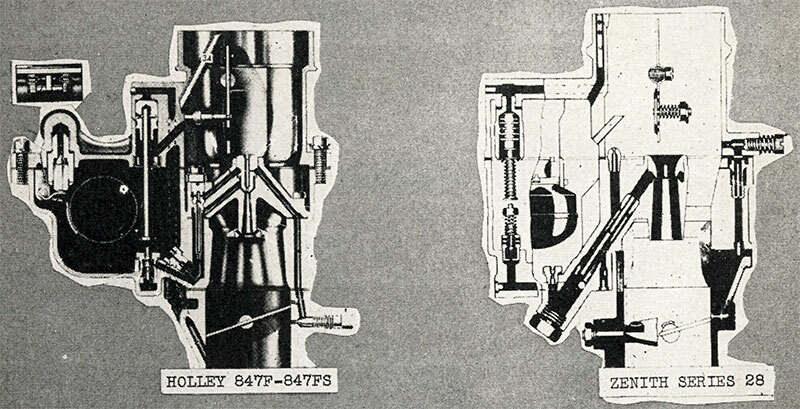 The heavy counterbalanced crankshaft; rubber-insulated torsional vibration damper; long-skirted pistons with four rings; full-floating piston pins; rifle-drilled connecting rods; floating-type oil intake; 10-inch clutch; and heavy-duty, 4-speed transmission are clearly shown. The new Green Diamond engine used in the 1/2, 3/4, 1, and 1-1/4 ton truck models has a 3-5/6 inch bore and 4-1/8 inch stroke and develops 82.8 brake horsepower at 3400 r.p.m. The new Green Diamond engine for the 1-1/2 ton truck model has a 3-5/16 inch bore and 4-1/2 inch stroke and develops 93 horsepower at 3400 r.p.m. 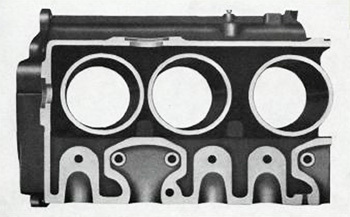 The compression ratio of both engine models is 6.3 to 1. In addition, there is a new “Economy Six” Green Diamond engine with 3 inch bore and 4-1/8 inch stroke, available for all models, which develops 64 horsepower at 3300 r.p.m. and has a compression ratio of 6.7 to 1. All three engines are designed to use standard fuels. It is not necessary to use high-octane rated fuels which sell at a higher price per gallon. 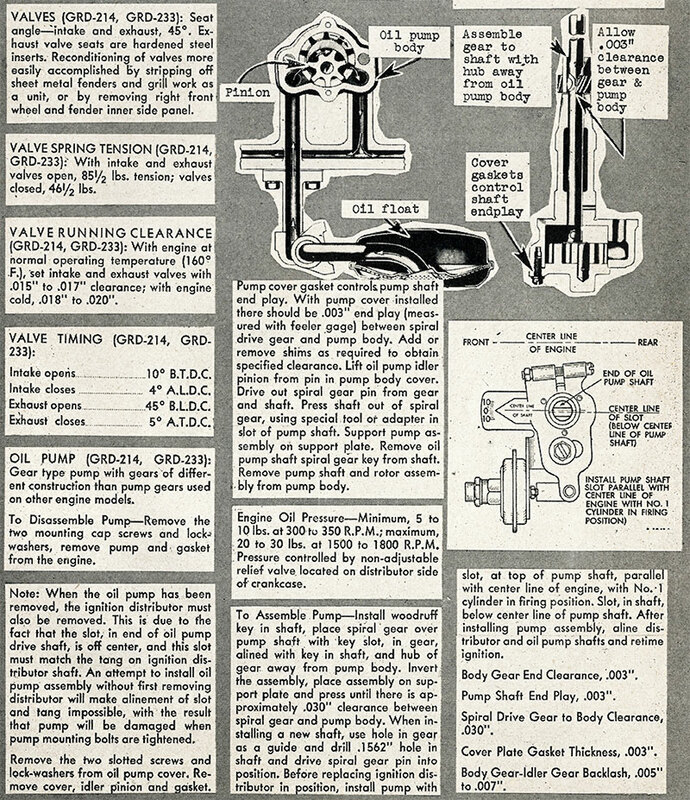 Efficient, oil-bath-type air cleaner on International Green Diamond engines, showing the new and exclusive type of dust-proof seal with rubber gasket in the connection between the air cleaner and carburetor. 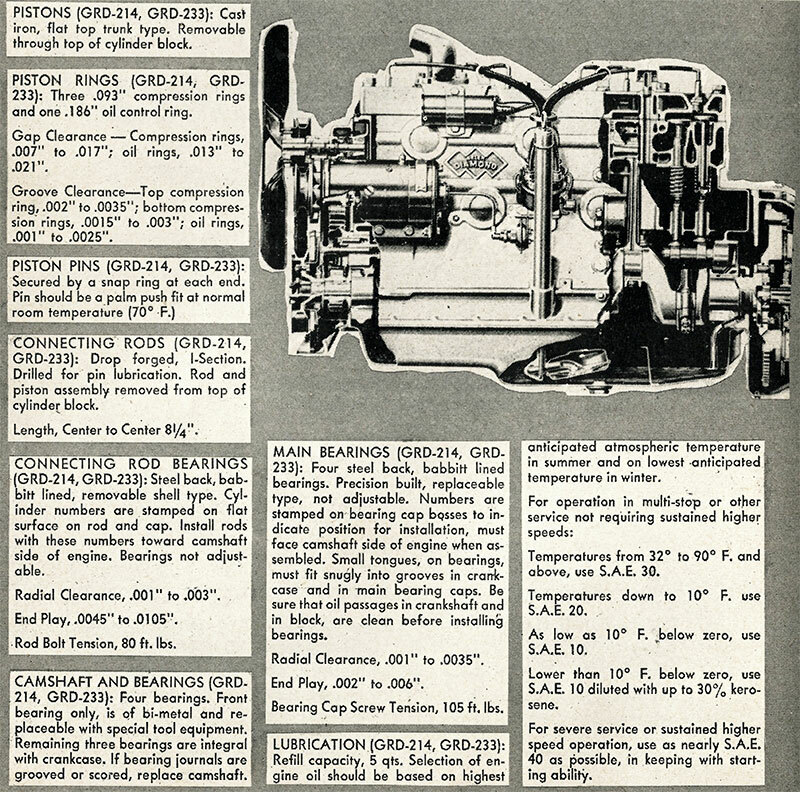 The torque of all three engines remains high over a wide speed range. 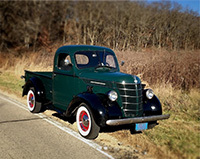 maximum torque of the 82.8-hp engine is 159 pounds-feet at 1100 to 1500 r.p.m., of the 93-hp engine is 181 pounds-feet at 800 to 1200 r.p.m., and of the “Economy Six” is 120 pounds-feet at 800 to 1000 r.p.m. The clearance between tappets and valves has been increased – a desirable feature for heavy-duty truck service and long valve life. In spite of this large clearance, however, the new Green Diamond engines are unusually quiet and smooth-running. The quietness has been achieved by new and scientifically contoured cams. Easily replaced, precision-type, steel-backed, babbitt-lined main and connecting rod bearings with large area are employed, assuring ample capacity and proper oil control. 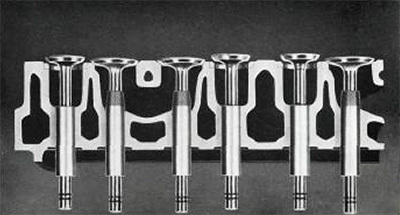 Time-proved features of value in previous 6-cylinder L-head International engines have been retained – full pressure lubrication to main, connecting rod and camshaft bearings, piston pins, and timing chain; replaceable-shell, precision-type main and connecting rod bearings; counterbalanced crankshaft; hardened exhaust-valve seat inserts; balanced downdraft carburetion; oil-bath type air cleaner; wire-wool air filters in crankcase ventilator intakes; and floating-type oil intakes. In addition, the new Green Diamond engines have several new features which contribute to dependable starting, long life, and improved performance. Constantly increasing road speeds combined with maximum loads place unusually severe demands upon cooling systems of truck engines. To adequately meet these conditions the Green Diamond engine is designed to provide water jackets which completely surround each cylinder bore and extend the full length of the cylinder. A spring-loaded choke valve, mechanical-shift starter, and larger-size flywheel ring gear are three new features which contribute to easy starting. The new choke valve takes the human element out of choke control, preventing engine flooding. 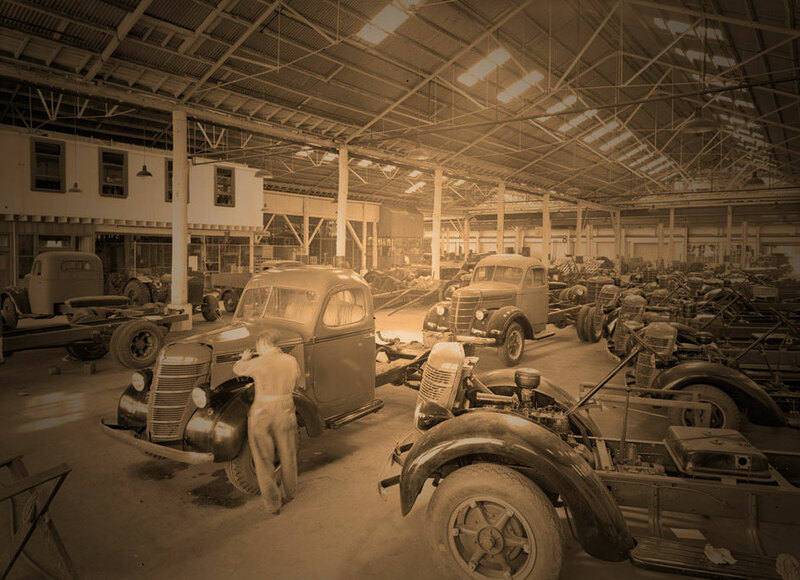 It assures easier starting of the engine in cold weather. The new mechanical-shift starting-motor pinion remains engaged with the flywheel ring gear as long as the driver keeps his foot on the pedal. This makes it possible to spin the engine long enough for a sure start. An overrunning clutch in the starter prevents the starting motor armature from being driven at excessive speed. Positive engine cooling is assured as water jackets completely surround each cylinder bore and extend the full length of the cylinder. Because of the new large-size flywheel ring gear more torque is available for starting the engine. The large-diameter flywheel also has the effect of increasing the smoothness of operation of the engine, especially at low speeds, and makes possible a lower idling speed. The fuel tank on the new Internationals is located low in the frame and the fuel line (from tank to engine) is outside the truck frame. 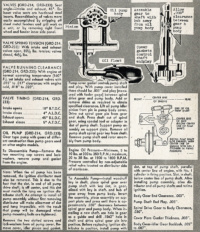 In addition, the fuel pump is of the inverted type. The fuel tank, fuel line and fuel pump, therefore, are all located where they are exposed to air circulation. This provides a valuable safeguard against vapor lock – it prevents “starving” the engine for lack of fuel by reason of the fuel vaporizing in hot weather and blocking the fuel line. 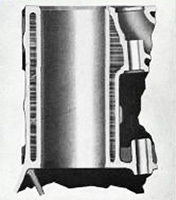 This cross-section through part of the Green Diamond engine block shows the larger water passages which completely surround intake and exhaust-valve ports which facilitate the escape of hot exhaust gasses; the heavy-duty, truck-type valves with full-size stems; and the hardened exhaust-valve seat inserts. 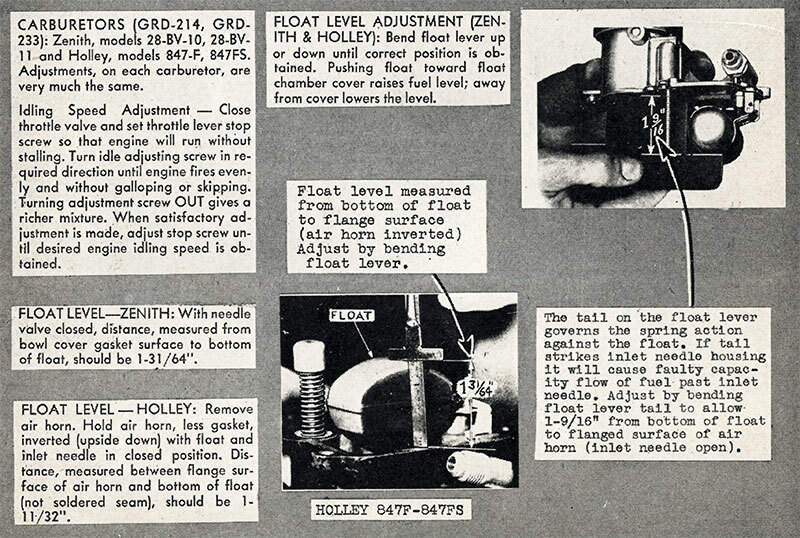 A fine-edge-type fuel filter assures a clean supply of fuel to the carburetor. 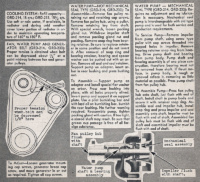 It is located in the carburetor and therefore eliminates the possibility of damage from dirt entering the fuel line connections between the tank and the carburetor. Hardened exhaust-valve seat inserts retard valve burning and make frequent valve grinding unnecessary in International Green Diamond engines. In addition, valve stems are silchrome steel, which is also heat-resistant. 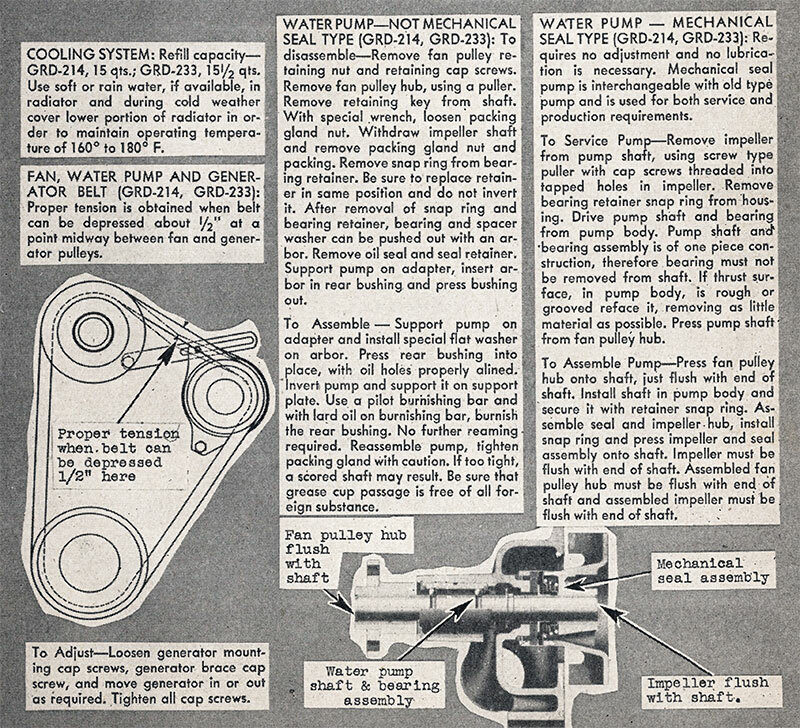 carburetor on Green Diamond engines is protected by a new V-type seal with rubber gasket which prevents dirt or dust from entering the connection. Other new Green Diamond features which contribute to long engine life include improved, non-clogging pressure lubrication to the timing chain; a ball-bearing-mounted water pump shaft; rubber-mounted radiator; and three-point rubber mounting for the engine. The spark plugs are of a new, longer-life type. They have a larger center electrode and a larger ground wire which is flat, thereby maintaining the proper spark gap clearance over a longer length of time.